Everything is set for your big day; right from your exquisite trousseau, make-up to jewellery. But is that enough to make a grand entry? With all eyes geared towards the bride on the wedding day, modern brides today look for unique options to make that statement entrance. These include chaadar of lights, horse-drawn carriages, ramp walk and so on. But for those opting for a traditional palki, we‘ve assembled a list of dazzling wedding palki decoration ideas you could choose from to match your style statement. If you wish to highlight your radiant appearance, this palki decoration is the best one to opt for. The soft coloured flowers elegantly placed on the borders of the palanquins accentuate the white layout and pearls. You could add crystals to the palki decorations to make the overall appearance more stunning. The elegant white arrangement works well to bring attention to your overall bridal look, giving you the star-like feeling you aimed to achieve when making an entrance. You can never go wrong with the traditional royal palanquins. Featuring sophisticated designs and imperial motifs, this style of wedding palki decoration is an all-time favourite. You can opt for gold, bronze or a combination of gold and bronze to draw attention to its intricate design. You could choose to surround the entering path with rows of flowers or a plain red or gold cloth, whichever best matches your venue décor. Want your dream wedding to come true? Then this half-open palki design decorated in a fairytale theme is a perfect choice for you. With contemporary brides opting for pink, green and peach-coloured modern lehengas as their wedding couture, this wedding palki decoration draws attention to the bride. Create a sense of mystery with this wedding palki decoration. This unique set-up is just the right way to make a grand bridal entry with all eyes set only on you. Surrounded on all sides with net sheets and strings of genda phool, this palki design gives a slight glimpse of the bride making the anticipated guests and your groom a little more anxious to see her arrive in style. This rich-looking, boathouse-styled wedding palki decoration is an unusual and perfect to make a jaw-dropping entry. Covered on top with just the sides open gives a compact and clear view of the bride sitting inside. The bride too has a view of all the hustle-bustle happening around. 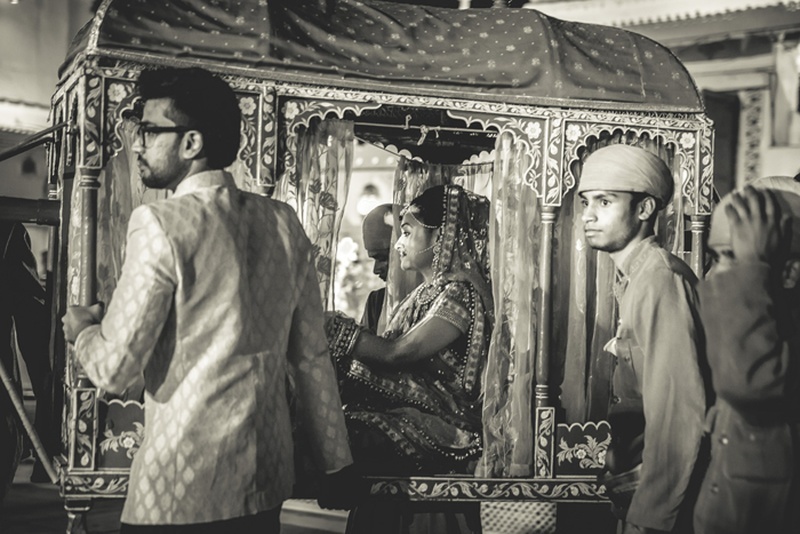 Make an exclusive entry in this majestic palanquin. No, we’re not kidding! This isn’t our personal favourite, but we thought you might like or probably love the idea of arriving at your venue on wheels. The latest to have caught the attention on wedding scene is a palki that moves on wheels. You can choose to decorate the palki in crystals, pearls or flowers in whichever shape you like. This type of palki also eliminates the effort of carrying the bride all the way to the mandap. Weddingz Recommends When deciding on the palki decorations, choose the best palki decorators or have your venue decorators take care of it. Make sure it stands out from the venue décor and perfectly blends with your couture. Also, keep in mind the people who will be carrying your palki. It’s best to keep the decoration minimalistic yet theme-driven and elegant.